Anyone who has travelled to India will tell you that we're very fond of perfume. Flowery perfume, that is. We strew flowers on our marriage beds. Women wear flowers in their hair. We offer flowers to our gods. Roses are a great favourite - we sprinkle rose-water on guests at weddings. 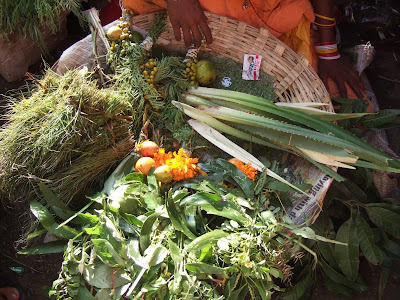 Among the most popular flower-perfumes is kewra. I've often seen little bottles of kewra essence in the Muslim shops on Mohammed Ali Road. But until recently, I didn't know where the perfume came from. Last month, I was walking through Bhuleshwar, when we spotted a flower-seller's basket. "What are these?" I asked the flower-seller, pointing to the long spiny leaves. "Kewda", she said. "Here, see how nice it smells." 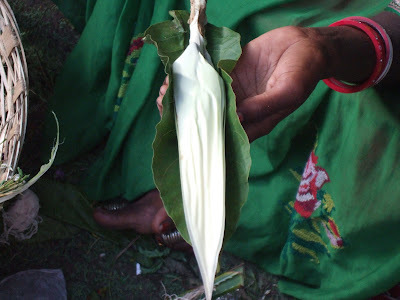 Inside the closed pod, there was the white kewra flower; it is called ketaki in Sanskrit. The smell was sweet, but faint. Perhaps I'd have to open the pod to release the scent. "Do you want to buy it?" she asked. "Ten rupees for one." "What do I do with it? ", I asked. "Offer it to Ganesh-ji" she said. Apparently, the Elephant God likes this stuff. His father Shiva used to like the ketaki too, until one day, the flower earned his wrath by bearing false witness. Do you know the story of how the ketaki flower fell from grace? I decided against buying. Whether the Gods like the ketaki or not, I don't. The smell is too flowery, too intense for me, although it is a scent associated with romance. the thunder hints at a mighty cloudmass. when separated from his love. Put like that, it does sound appealing, doesn't it? 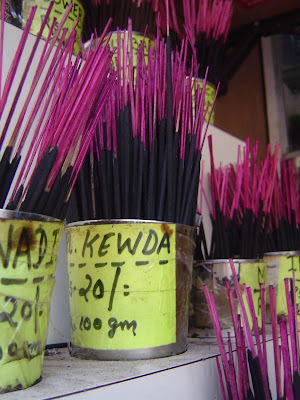 Next time you want to try something romantic on a rainy night, go buy a kewra incense stick. Perhaps the magic of the ketaki will work for you. P.S. If you're looking for the English name for this plant, it's screw pine. Pandanus something or the other. They use it in Malay and Thai and Indonesian cooking. P. P.S. Hey Cristy, thanks for the photos! i am farhad from south of IRAN. we have this flower in our city. i want to have more information about this flower in india.